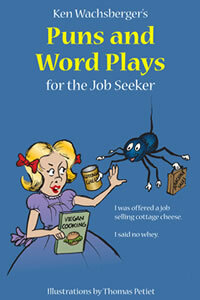 I’m happy to announce that the ebook version of my new book, Ken Wachsberger’s Puns and Word Plays for the Job Seeker, is available as an ebook as of today, March 7, and I want you to have a copy of it as my gift. It is available from Smashwords, the writer-friendly platform of choice for independent writers who want to publish electronically. It is also available at Barnes & Noble, Kobo, and Apple. Its usual price will be $2.99. But for you, it’s free, in ebook or pdf format, during the entire month of March. Simply place your order using the following coupon: HM65Z. I hope you enjoy it. It’s a funny book if the reviews can be believed, and you know you can use the laughs. I didn’t expect to write a book about puns. The topic wasn’t on my radar of ideas that could be turned into books one day. All of my previous books—histories, memoirs, textbooks—require long periods of concentration to finish. Puns can be read, I’m told, in twenty minutes. My previous books are an antidote to TV watching. Puns can be read during commercials of an hour-long TV show. The “Am-I-good-enough-to-write-a-book?” phase for some books lasts longer than it took me to write this book. But a pun came to me one night: “You’ll never get rich being a member of the loyal opposition, but you’ll earn a dissent living.” I woke up laughing and wrote it down. The next day, I posted it on Facebook and launched a pun war that evolved into this book. Meanwhile, on a different trajectory, my father, who died in 2011, was approaching what would have been his one-hundredth birthday, which is this April 15, 2018. When the two trajectories intersected, I remembered that my dad was one of the legendary dinner-table punsters, and so his birthday became my deadline to publish the book. The copyright date is his birthday and the release date, today, is my folks’ anniversary. I’m grateful for the artistic support and inspiration from Tom Petiet, legendary Ann Arbor artist and actor. If you still prefer feeling the pages of a book as you read it, you can purchase softcover copies here. If you can be so inspired, please post on honest review wherever you purchase the book. Thanks if you’ve read this far.